The Valley City State University Pre-Professional Club will host a Community Soup and Sandwich Feed on Wednesday, Feb. 24, 2016, from 4:30-6:30 p.m. at the VFW, located at 138 E. Main St. in Valley City. 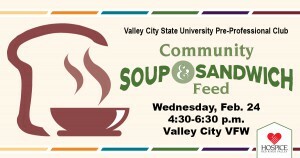 The Community Soup and Sandwich Feed is open to the public. Tickets cost $7 per person; children under five eat for free. Proceeds from the event will be used to advance the club, and a portion will be donated to Hospice of the Red River Valley. Tickets may be purchased in advance by contacting Hilde van Gijssel at (701) 845-7337 or hilde.vangijssel@vcsu.edu. Tickets purchased in advance will be held at a will-call table. Tickets may also be purchased at the event.